Parties representing themselves may find legal information, assistance with completing forms and learn about court procedures at Legal Self Help Services, Civic Center, Hall of Justice, Room C-27, San Rafael. For more information regarding the services provided by Legal Self Help Services, click here. Due to the length of time it takes to initiate a new lawsuit, documents received in the clerk’s office after 3:00 p.m. will be time stamped with the current date and processed the following court business day. The date of filing will be the time stamped date. See more information about procedures for filing court documents by clicking here. Please click here for more information about ex parte appearances. Please click here for Jurisdictional Limits. A small claim is a special type of limited jurisdiction case. Because these cases are processed differently than other limited jurisdiction civil cases, information about and help with filing small claims cases is available by clicking here. Judicial officers use a variety of strategies for resolving civil disputes. In addition to traditional court and jury trials. These approaches are designed to reduce costs and case processing time for litigants. Referred to as Alternative Dispute Resolution (ADR), these strategies include mandatory settlement conferences, mediation, arbitration, and neutral case evaluation. See more information on ADR from the Judicial Council or by calling the Court's ADR Coordinator at (415) 444-7040, Option 6. You may also get more information about the Court's program by clicking here. Attorneys and parties representing themselves can make court appearances via telephone under certain circumstances. See more information about the program by clicking here. 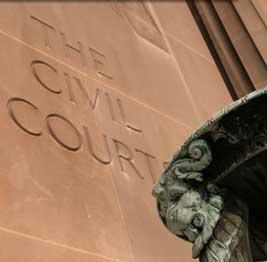 The Court issues law and motion tentative rulings in certain types of civil matters. Click here. Cases filed with the Civil Clerk's Office may be available for review by the public in the Court's Records Management Office in Room 113 of the Civic Center. Please click here for information on how to request a case record or register of actions for viewing and copying. There is a $15 fee for each case when research must be performed by court staff. Please include a check made payable to Marin County Superior Court and send it to: Civil Research, P.O. Box 4988, San Rafael, CA 94913. If requesting copies or other records-related services in addition to research, such as certification or exemplification of documents in case files, please review the amounts of these additional fees on the Court's Fee Schedule by clicking here. Then submit your written request with a self addressed manila envelope with proper postage and a check to the Court stating a "Not To Exceed" amount in the memo section of the check that allows for the cost of the research and any other records-related fees. Court staff will fill in the actual amount of the check once it is determined. The Civil Clerk's Office processes legal disputes brought by parties to recover money, real or personal property; enforce a contract; collect damages for injuries; or protect a party's civil right. Based on the dollar amount sought by the plaintiff or petitioner at the time of filing the original petition or complaint, civil matters are either defined as unlimited or limited jurisdiction cases. This distinction is important because the filing fees and some case processing procedures vary, based on this classification. Court employees may give members of the public legal information, direct them to Judicial Council and local forms or offer referrals to legal service provider agencies for help in completing paperwork or understanding court procedures. Please note that court employees are prohibited by law from giving legal advice.